Daniel Lubrich is well aware that starting from scratch a business that aims to tangle with aerospace giants like Airbus, Bell, and Lockheed Martin is ambitious enough by itself, much less aiming to one day certify an aircraft unlike any that has flown people before. He started by building a crowdfunded drone, but that’s only the first step. The SkyProwler 2's side rotors can retract into the fuselage, transforming to and from a fixed-wing configuration in flight. This unmanned aircraft can also be flown with wings removed. Photo courtesy of Krossblade Aerospace. 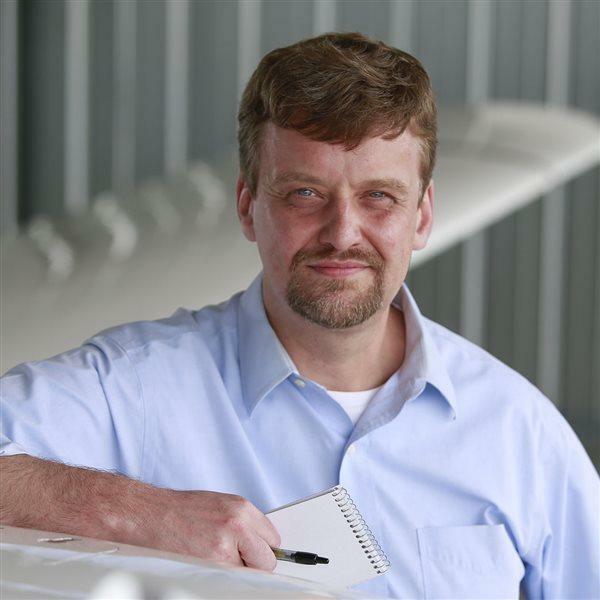 Lubrich brought an Oxford University doctorate in physics to the team at Krossblade Aerospace that has worked since 2015 to bring SkyProwler 2 to market. The vertical-takeoff-and-landing design transforms to fixed-wing configuration in flight, the four rotors and arms that got it off the ground tucking neatly into the fuselage to reduce drag. SkyProwler 2 can be flown with or without the wing installed, allowing users to opt for reduced weight and drag when strictly vertical flight is called for. Lubrich, the company co-founder and chief technology officer, said April 9 that SkyProwler 2 is the second generation of an aircraft in development since 2015, marking improvements in performance, endurance, and overall capability. Krossblade Aerospace has been taking a new order every other day on average since the first of the new model was sold in early February. A Kickstarter campaign in 2016 followed by the official launch of the previous iteration of SkyProwler drove nearly 1,000 deliveries of the SkyProwler 2’s predecessor, and in this market Lubrich's firm plays David to DJI’s Goliath, with a system priced higher than a DJI Phantom 4 but below the price of DJI’s larger models, though lacking a truly comparable camera option, and no thermal imaging solution at all—yet. “We’re working on it,” Lubrich said of the infrared sensors in hot demand for public safety and industrial inspection applications. He was reluctant to commit to a release date, and refreshingly pragmatic when it comes to the larger plan. A larger version of this aerial transformer will be capable of more sophisticated payloads and missions, and Lubrich said that will open the door to sales to professional operations. Most customers to date have been serious hobbyists, with a few professional users seeking what Lubrich described as a “prosumer” rig. Once that much larger drone is off the ground, the design will scale up again to a single-pilot configuration with room for cargo. That would be followed by another step up in size to a version with room for five people. But his training in physics taught him a great deal about energy and its applications, and Lubrich suspects that much of the enthusiasm surrounding electric VTOL concepts being touted as the future of urban air transportation may suffer from the high energy demands of vertical powered flight and the relatively low energy storage potential of known battery technologies. That’s part of why the future SkyCruiser, as the manned iteration has been dubbed on the drawing board, will have a hybrid propulsion system, with an internal combustion engine that spins a generator that charges a battery which powers the system, in the event of engine failure, long enough to allow the pilot to pick a landing location instead of a crash site. Count Lubrich among those who remain skeptical that any propulsion system relying on batteries alone will ever be able to safely fly a VTOL aircraft more than roughly 30 minutes; 15 minutes if a power reserve is maintained for safety. Being able to transition to and from a fixed-wing configuration in flight makes the aircraft far more efficient in cruise, and Lubrich said the scaled-down version (about five pounds of carbon fiber frame and accessories) has demonstrated solid reliability, even with the somewhat mechanically complex retractable rotor arms. The future manned version will also have an airframe parachute, though that would be the last in a line of redundant safety systems, including a battery capable of powering a few minutes of VTOL flight. The development time for that last step is likely to be shorter, Lubrich noted. Once a human has flown this thing, making room for more is a lower hurdle to clear.